Wildfire smoke is affecting air quality in the Eugene area. We take our students’ health and safety very seriously, and closely monitor conditions to guide decisions around school-sponsored outdoor student activities. Eugene School District 4J staff regularly monitor the Heat Index and Air Quality Index and do regular visual inspections of outside air quality to determine outdoor activity levels for students, per the public health guidance from the Oregon Health Authority and Oregon School Activities Association. Decisions regarding athletics will be made daily as necessary. When air quality conditions are unhealthy for sensitive groups, with AQI over 100, practices will be moved inside or canceled and games will be rescheduled or canceled. High school athletic directors, coaches and support staff will notify families whose students participate in OSAA activities if any changes are made to practice or game times and locations. Any changes to OSAA-sanctioned high school game schedules also will be posted on the OSAA website. 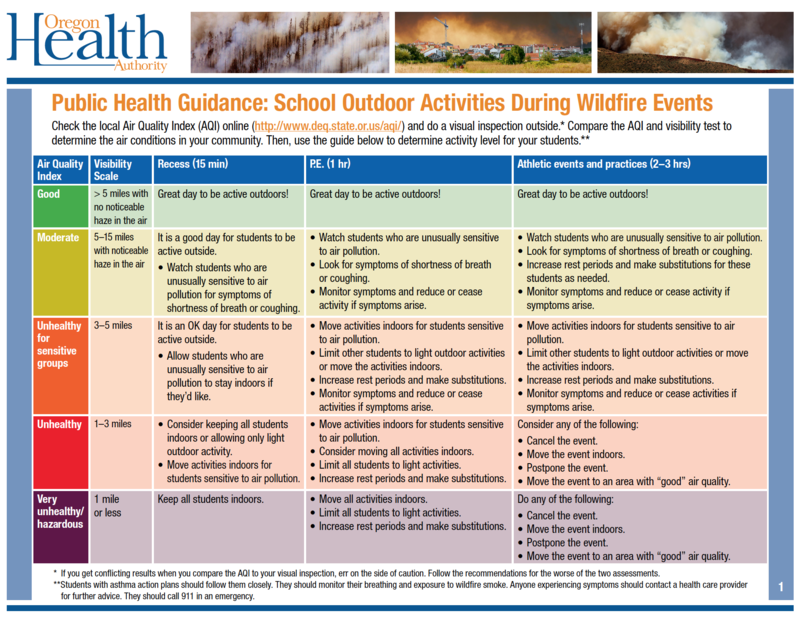 The Oregon Health Authority advises that parents of sensitive children should follow their health care providers’ advice about prevention and treatment of symptoms, and watch the smoke forecast to decide when to limit their child’s activities. Children who may be more sensitive to air pollution include those with asthma, respiratory infection, lung or heart disease.